Ashley Owens started her design education in the Honors Program at Iowa State University in Ames, IA. She transferred to the Boston Architectural College where she graduated with her Bachelor of Architecture degree. While studying at the BAC she also worked there, tutoring other students in the Learning Resource Center on a broad range of subjects. She started her design career with Cutler Associates in Worcester, MA, a design-build company that specialized in tilt up construction. Ashley spent 2 years at Cutler where she worked on projects like Hawthorne Hall at Endicott College. After Cutler, she received her Real Estate License which she used to learn the process and market for buying, selling, and rental properties. She spent 3 years working actively for a local broker before accepting a position with the developer and property management company, Boston Properties, in their Construction Department. 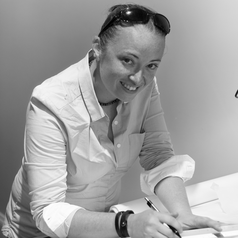 She found her way back to Architecture in 2011 when she was offered a position with Studio Troika where she spent 5 years as a Senior Designer/Project Manager. She was responsible for projects ranging from commercial office fit-outs to dental practices and private residences. In 2016 Ashley accepted a part-time position with Building Science Corporation and joined with Jamie Schwadel in founding [RE]Architect. Since 2016 the company has completed over a dozen projects, both commercial and residential. Design focus was to create a strong brand impact at the entry to show potential talent that this large well known technology firm is just as vibrant, creative, and out of the box as any new kid on the block. The design used bright colors and graphics coupled with one of a kind shipping palette lighting, soffits and furniture to reinvigorate and energize the office promoting collaboration and new ideas. ​The design of their new offices in the Boston area focused on small individual workspaces with a large mix of break out collaborative and social options. The unique combination of upscale furniture with raw plywood and concrete finishes creates a one of a kind work environment. Creativity and room for personalization are incredibly important when designing an artist space. There is special care taken to allow them room to grow and develop within their space. At the same time the space must be exciting and stimulating enough that it inspires new forms and ideas within the artist from the day they move in.